It measures thickness of metal without removing the paint or other coating on the top. Ideal for use on pipes, tanks etc in process plants and ship hull. Applicable Materials All homogeneous materials which allow transmission of Ultrasonic energy through it like most of metals, hard plastics, glass, ceramics etc with Protective Coating. Key Pad Sealed tactile type. Display 4 Digit LCD type. It displays Thickness, Velocity, Battery check, Coupling check, and stored readings with IDs. 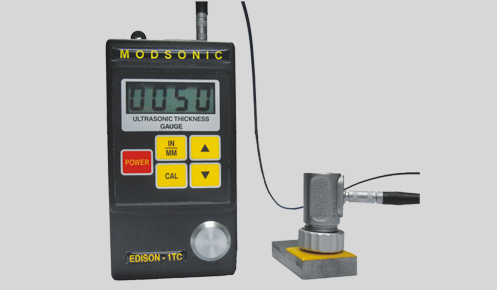 Calibration i> Probe Calibration: Not Required as it has Auto Probe Calibration. ii> Material Calibration: It can be done for any material. Unit Imperial (Inches) or Metric (mm) selection available. Battery Two Penlite Dry Cells (AA) or NiCd. Auto Power off 2 minutes after switching on/ last reading.